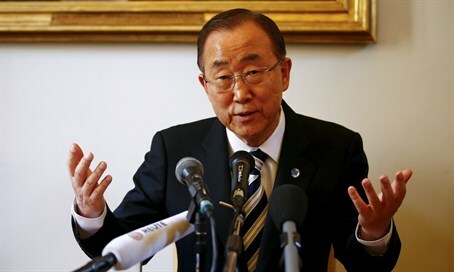 Ban Ki-Moon urges Iran to 'promote political solution' despite Tehran's terror proxy support, backing of Russian military involvement. United Nations (UN) chief Ban Ki-moon urged Iran on Monday to pressure its ally Syria to reach a peaceful resolution of the brutal civil war there, AFP reports. During a meeting with Iranian Foreign Minister Javad Zarif, Ban "reiterated that there is no military solution to the conflict and asked Iran to exercise its influence in promoting a political solution," his office said. Iran has, in fact, heavily supported Assad's regime militarily throughout the four-year war, funds a number of terror proxies (including Hamas and Hezbollah), and actively encouraged Russian airstrikes in the region. The two leaders also discussed Yemen, where the UN is trying to revive peace talks and where Iran plays a key role through its support of Houthi rebels, who are Shiite.